Welcome to the homepage of American Drainage Systems. 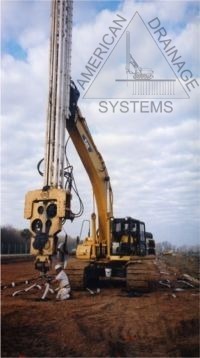 American Drainage Systems is the nations leading installer of vertical soil drains, also known as vertical wick drains or Prefabricated Vertical Drains (PVD), and horizontal strip drains. Our goal is to be the best vertical wick drain installation contractor in North America. We pride ourselves on our quality, timeliness, professionalism, and bringing the most value at the least amount of cost to our customers for installing vertical wick drains and horizontal strip drains. To achieve this, we are continually training and expanding in order to provide the best quality, wick drain installation equipment and craftsmanship to do the job. Our goal is to be the best vertical wick drain and horizontal strip drain specialty contractor in the country.